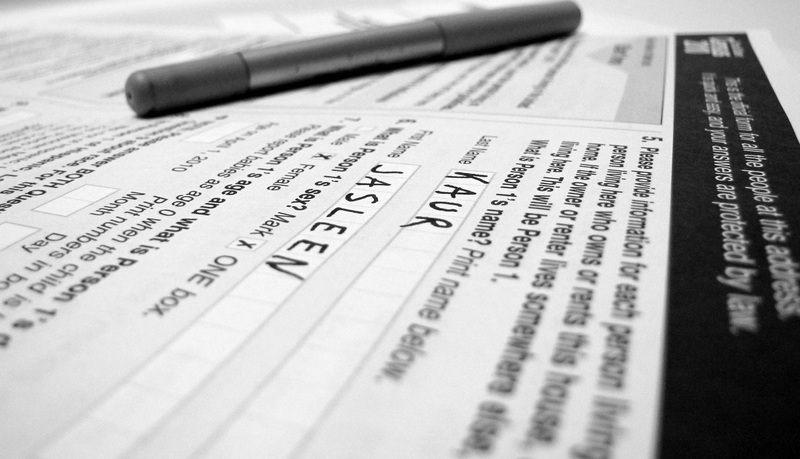 "Obligation" by Jasleen Kaur, used under CC BY-SA 2.0 / Desaturated from original, with colour filter. Over the past 50 years, many countries have seen a dramatic rise in the share of their adult population receiving disability benefits – and some argue that the explanation lies in a culture where dependency on welfare is passed from parents to children. By analysing a natural experiment provided by Norway’s system of disability insurance, this research presents some of the first causal evidence for the intergenerational transmission of ‘family welfare cultures’. In what turned out to be his final ‘state of the union’ address in 1992, President George Bush said ‘Welfare was never meant to be a lifestyle. It was never meant to be a habit. It was never supposed to be passed from generation to generation like a legacy.’ This idea that welfare dependency in one generation causes welfare dependency in the next generation is widely shared. Yet while there are strong intergenerational correlations in many countries in the use of various types of welfare programs, to date it has not been possible to show a causal relationship. There are at least three pathways that could drive a culture of welfare within families. The fact that parents receive benefits may supply information to their children about how to access the program. It may also reduce the stigma of participation. Or parents may as a result invest differently in their children’s development. Each of these channels implies that it is the parent’s experience with a welfare program that creates an intergenerational link. An alternative explanation is that the determinants of poverty or poor health are correlated across generations in ways that have nothing to do with a welfare culture, but which nonetheless translate into similar participation rates within families. Structural issues common to parent and child – such as decaying neighbourhoods, poor local labour markets or underperforming public schools – could be the underlying drivers of welfare use. This explanation says that while a child’s use of welfare may be correlated with a parent’s use, it is not caused by the parent’s welfare participation. Sorting out the relative importance of these explanations is central to understanding how economic conditions and government policies shape the persistence of welfare receipt across generations. Moreover, long-term cost calculations for expansions or cuts to various welfare programs require an understanding of any ‘intergenerational spillovers’. But estimating whether welfare dependency in one generation causes welfare dependency in the next generation is difficult given the likelihood of correlated unobservable variables across generations. Several studies have documented strong intergenerational patterns for a variety of socioeconomic variables, while others have shown that a large portion of the observed correlation in participation in the US Aid to Families with Dependent Children program can be explained by intergenerational correlations in income and other family characteristics (Bjorklund et al, 2006; Lee and Solon, 2009; Levine and Zimmerman, 1996; Oreopoulos et al, 2006). In addition, it is often difficult to access large datasets on welfare use that link family members across generations. These empirical challenges have meant that research has largely focused on intergenerational correlations in various types of welfare use. As Black and Devereux (2011) summarize, while the intergenerational correlations in welfare receipt are clear, there is much less evidence of a causal relationship. Our research provides some of the first causal evidence for the existence and significance of family welfare cultures. The gold standard in scientific research is the randomized controlled trial. 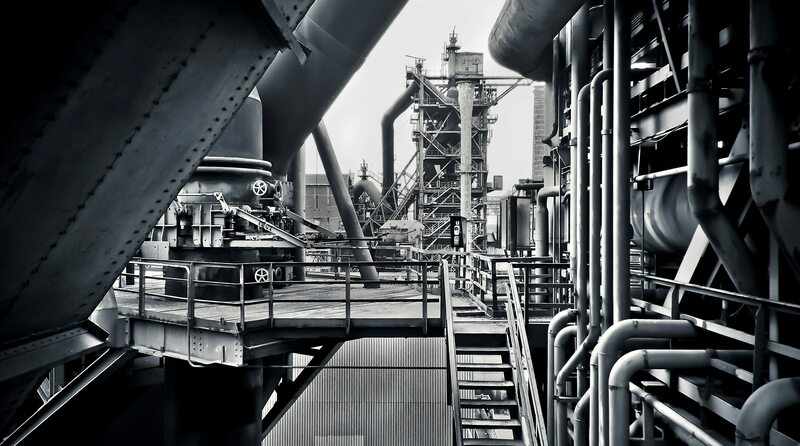 By construction, a correctly implemented experiment yields a causal estimate because it balances all of the potentially confounding factors between treatment and control groups. Due to ethical concerns and cost considerations, it would be difficult to implement a full-scale social experiment that randomized welfare receipt. But fortunately, there is a natural experiment that randomizes the probability that otherwise identical individuals are allowed to participate in a welfare program. We take advantage of this randomness to estimate causal relationships in a manner similar to a randomized controlled trial. We analyse a policy that randomizes the probability that parents receive welfare in combination with a unique source of population panel data. We estimate the causal relationship in welfare participation across generations in the context of Norway’s system of disability insurance (DI). The key to our research design is that the Norwegian system randomly assigns judges to DI applicants whose cases are initially denied. Some appeals judges are systematically more lenient, which leads to random variation in the probability that an individual will be allowed to receive DI. Since the variation is driven by the ‘difficult-to-verify’ cases, the randomization picks out the more marginal applicants. These applicants are particularly relevant for policy, since reforms aimed at stemming the rise in DI are likely to have the largest effect on them. Furthermore, in Norway and other countries, the expansion of DI rolls in recent decades appears to be primarily driven by a more liberal screening of marginal applicants with difficult-to-verify disorders, such as mental illness and musculoskeletal disease. We make use of this random variation to see if the DI participation of parents affects the probability that their adult children subsequently apply for and are awarded DI. Our approach uses the fact that appeals judges are randomly assigned and therefore their leniency in a parent’s case is unrelated to any other intergenerational factors, such as poverty or health, which might influence the DI participation of their children. As our measure of judge leniency, we use the average allowance rate in the other cases a judge has handled. 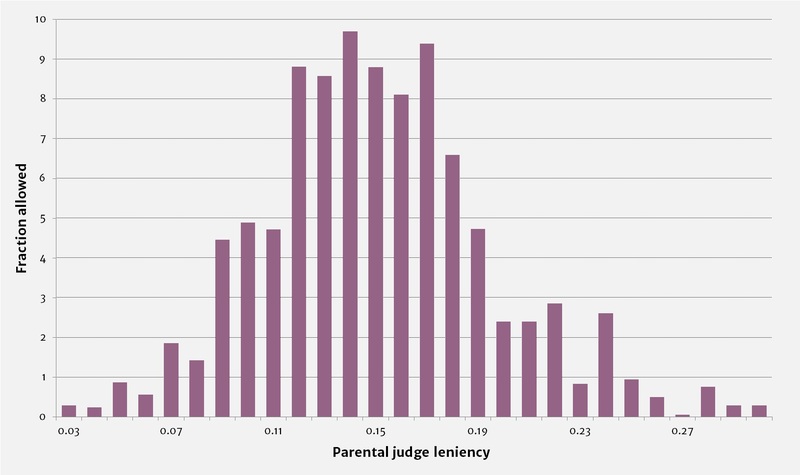 The grey bars in Figure 1 plot the histogram of parental judge leniency. On average, judges allow around 15% of the appeals cases they oversee. There is also wide variation in our measure of leniency, with approximately 22% of DI cases allowed by a judge at the 90th percentile compared with only 9% at the 10th percentile. As expected, judges’ leniency in other cases that they have handled is highly predictive of whether they will allow a parent’s current DI appeal. 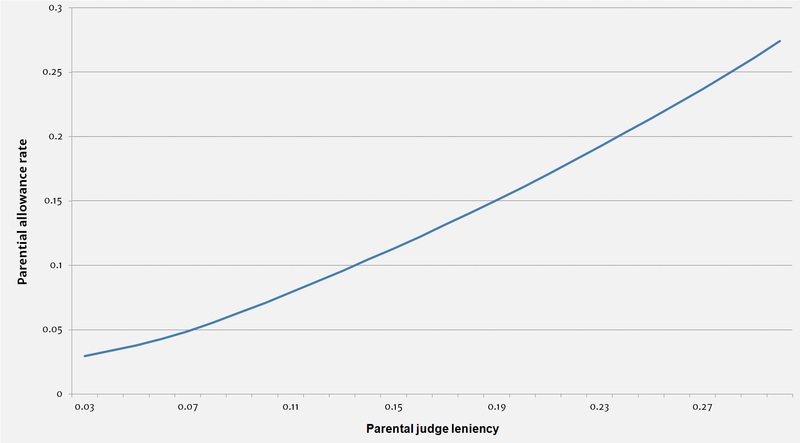 As Figure 2A shows, a one percentage point increase in a judge’s average allowance rate in other cases is associated with an almost one percentage point increase in the probability that the parent’s case is allowed. 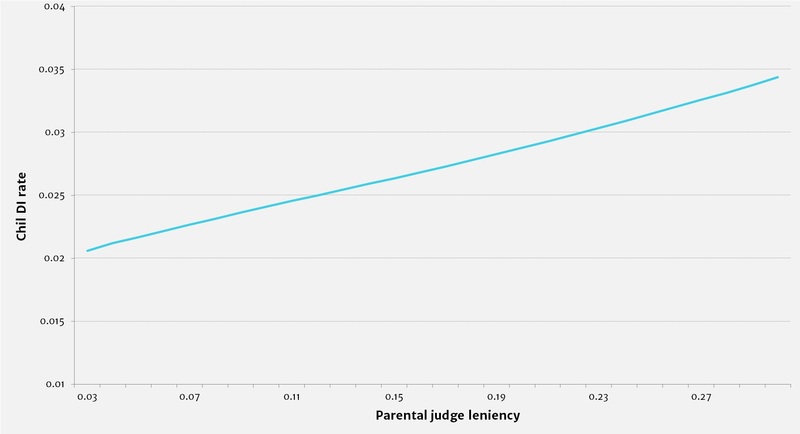 As should be the case with randomization, we find that judges’ leniency is uncorrelated with the attributes of a parent and their case characteristics. Using the random variation in judge leniency to estimate causality, we find that welfare dependency in one generation does indeed cause welfare dependency in the next generation. This can be seen in Figure 2B, which plots the effect of a parent’s judge leniency measure against their child’s DI participation. If there were no intergenerational spillovers in DI use, the solid line in Figure 2B should be flat, since the judge who handled a parent’s case should have no effect on the child. But in fact, a child’s DI rate rises the greater the leniency of the judge who previously handled their parent’s case. Approximately 2.5% of children whose parents had a relatively strict judge are predicted to participate in DI five years later. This can be contrasted with roughly 3% of children whose parents had a relatively lenient judge. Our analysis shows that when a parent is allowed DI by a lenient judge, their adult child’s participation rate increases by six percentage points over the next five years. We also find that this intergenerational welfare transmission amplifies over time; the effect of parental DI participation on their adult child’s participation rate reaches 12 percentage points 10 years after the judge’s decision. By comparison, we calculate that only 1% of these children would have been on DI if their parents had been denied DI. Moreover, our findings indicate that a parent’s experience with the DI system is not merely changing the timing of when their children participate. Consistent with this increase in adult children’s welfare dependency, we find that parental DI receipt decreases the probability that a child will work or pursue higher education. We think of the spillover effects in welfare receipt within families or other social networks as measures of welfare culture, with the understanding that culture may operate through information, beliefs, or norms (Bertrand et al, 2000). Our rich data allows us to explore the nature and breadth of such welfare cultures. First, we use our research design to examine spillovers in other social networks. Our findings point to a special link between parents and their children, with little, if any, impact of DI receipt by close neighbours. But we cannot draw firm conclusions about spillovers across siblings or spouses. Second, we examine how the intergenerational transmission of DI receipt depends on the type of parent-child link. Our findings suggest that parents’ influence on children’s decisions to apply for DI is not specific to the living arrangement or age of the child. Third, we explore how intergenerational welfare transmission operates. By construction, it is unlikely to be information about how to apply for the program or appeal against an unfavourable decision, since all parents in our dataset go through these two processes. 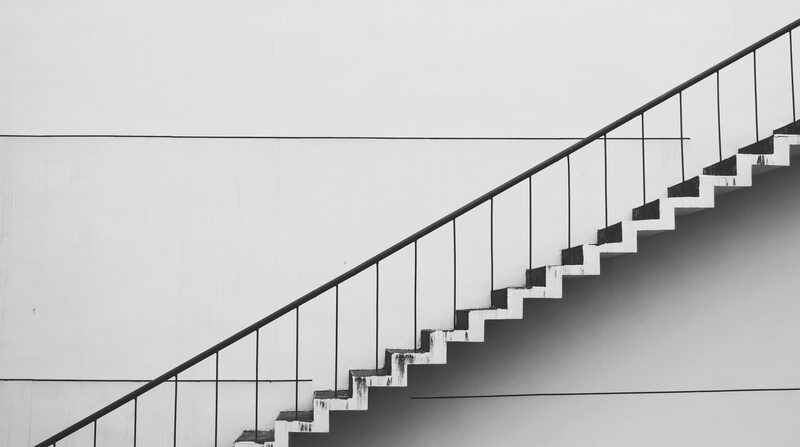 What may change as a result of a parent being allowed DI are their children’s beliefs about the efficacy of trying to get on to the DI program. Suggestive evidence for this comes from an analysis showing that children whose parents got a lenient judge are not only more likely to apply for DI, but are also more inclined to report the same type of medical disorder. Parental allowance may also change a child’s attitudes about participation and its stigma: if so, this appears to be DI-specific since it does not affect a child’s receipt of social assistance (that is, traditional cash welfare). Our focus on DI receipt is highly relevant for policy since disability benefits now constitute one of the largest transfer programs in many developed countries. For families without small children, DI is often the only cash benefit available after unemployment benefits run out and it has therefore become an increasingly important component of the social safety net. Over the past 50 years, DI rolls have steadily risen from less than 1% to over 5% of the adult population in the United States (Autor, 2011); from 1% to 7% in the UK; and from 2% to almost 10% in Norway. Many have argued these increases are fiscally unsustainable, especially as current DI recipients are younger and have longer life expectancies on average compared with previous cohorts of recipients (Autor and Duggan, 2006; Burkhauser and Daly, 2012). Our study complements a growing body of research on the causes and consequences of the growing DI rolls. To date, research has largely focused on estimating the work capacity and labour supply elasticity of DI recipients (for example, Kostol and Mogstad, 2014). Less is known about what causes individuals to apply for DI, why disability rolls have risen so dramatically and how the receipt of DI affects individuals on margins other than labour force participation. Our study provides some of the first causal evidence on what influences DI applications and what the effects of DI participation are for children of recipients. The magnitude of our estimates suggest that intergenerational transmission could play an important role in explaining the dramatic rise in DI participation over the past few decades. 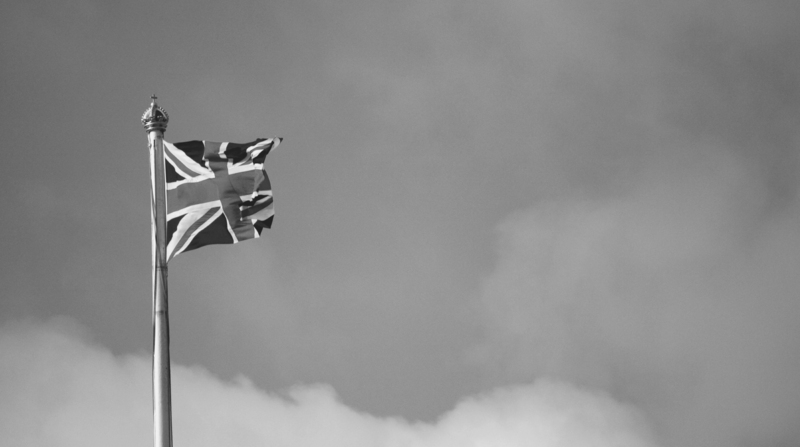 Our findings are particularly important for evaluating the long-term costs of welfare reforms, as any changes will affect not only the current generation but also their children. We use our estimates to simulate the total reduction in DI participation from a policy that makes the screening process more stringent by making judges roughly 10% stricter on average. In the early years after the simulated policy change, most of the reduction in DI participation can be attributed to the direct effect on parents, as there is little opportunity for children to learn and respond to their parent’s DI experience. In contrast, the intergenerational effect grows over time; after 10 years, almost half of the reduction in DI can be explained by the reduced participation of the children of the original applicants. This simulation makes clear that failing to account for intergenerational effects will provide misleading projections of post-reform participation rates. To translate the participation patterns into cost terms, we calculate the net present value of the simulated policy change over time. Making judges approximately 10% stricter decreases the net present value of program expenditures after 10 years by roughly 8%. Two thirds of this cost reduction is due to fewer parents being on DI. But one third of the reduction is due to the fact that fewer children participate in DI. If one were to extrapolate the past 10 years by assuming that there are no further changes in DI take-up among parents or children after year 10 and that parents and children stay on DI until they reach retirement at age 67, the contribution of children to total costs is even more important. Almost 60% of the reduction in total costs is now accounted for by the reduction in children’s participation. This is due to the fact that children entering DI have many years left before retirement, while parents are older and leave the system sooner. Our findings show that parents’ use of government assistance drives use in the next generation. We also provide some initial evidence on the nature and breadth of the mechanisms involved. From a policy perspective, our findings imply that welfare reforms can have long-lasting effects on program participation and costs, since any original effects on the current generation can be reinforced by changing the participation behaviour of their children. This article summarizes ‘Family Welfare Cultures’ by Gordon Dahl, Andreas Ravndal Kostol and Magne Mogstad, published in the Quarterly Journal of Economics in 2014. Autor, DH (2011) ‘The Unsustainable Rise of the Disability Rolls in the United States: Causes, Consequences, and Policy Options’, NBER Working Paper No. 17697. Autor, DH, and Duggan, MG (2006) ‘The Growth in the Social Security Disability Rolls: A Fiscal Crisis Unfolding’, Journal of Economic Perspectives 20(3): 71-96. Bertrand, M, Luttmer, EFP, and Mullainathan, S (2000) ‘Network Effects and Welfare Cultures’, Quarterly Journal of Economics 115(3): 1019-55. Bjorklund, A, Lindahl, M, and Plug, E (2006) ‘The Origins of Intergenerational Associations: Lessons from Swedish Adoption Data’, Quarterly Journal of Economics 121(3): 999-1028. Black, S, and Devereux, P (2011) ‘Recent Developments in Intergenerational Mobility’, Handbook of Labor Economics 4: 1487-1541, Elsevier. Burkhauser, RV, and Daly, MC (2012) ‘Social Security Disability Insurance: Time for Fundamental Change’, Journal of Policy Analysis and Management 31(2): 454-61. Dahl, GB, Kostol, AR, and Mogstad, M (2014) ‘Family Welfare Cultures’, Quarterly Journal of Economics 129(4): 1711-52. Kostol, AR, and Mogstad, M (2014) ‘How Financial Incentives Induce Disability Insurance Recipients to Return to Work’, American Economic Review 104(2): 624-55. Lee, C, and Solon, G (2009) ‘Trends in Intergenerational Income Mobility’, Review of Economics and Statistics 91: 766-72. Levine, P, and Zimmerman, D (1996) ‘The Intergenerational Correlation in AFDC Participation: Welfare Trap or Poverty Trap?’, Discussion Paper 1100-96, Institute for Research on Poverty. Oreopoulos, P, Page, M, and Stevens, AH (2006) ‘Does Human Capital Transfer from Parent to Child? The Intergenerational Effects of Compulsory Schooling’, Journal of Labor Economics 24: 729-60.